Finally, the 10th Almanac is here! Doc's 10th Almanac is now available in paperback and ebook. This book is beautiful and packed with information you will love! 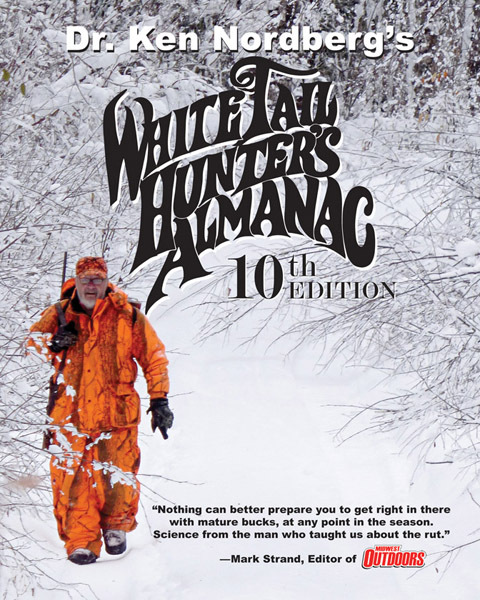 This book includes: updated important information from his first 9 Almanacs, his best ideas that he has been writing about in his hunting articles over the last 21 years — including updated tree stand hunting and portable stool hunting tactics — and his latest and greatest hunting tactics. 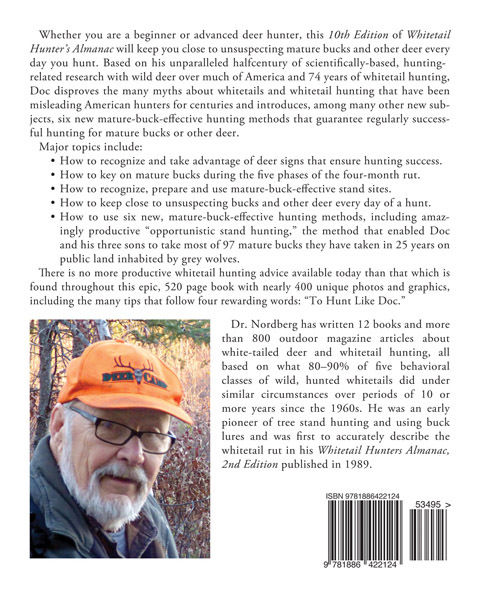 I think most hunters are going to really love learning all about Doc's latest hunting technique, “Opportunistic Stand Hunting!” This technique definitely advances the art of deer hunting. The 10th Almanac is now available in both paperback and ebook versions. Both versions have have a color cover and black and photos inside. To find it on Amazon, click here. The Amazon ebook has a very large free preview. Look for the “Look Inside” button above the cover. Link to the 10th Almanac ebook on Amazon. Doc is autographing copies with the name given in the order form. If you would like Doc to autograph your copy(s) with a different name, or in a special way, please let me know (jtnordberg@comcast.net) and I will pass it along to him. The paperback is 8 x 10 inches. There are 508 text pages, 376 photos, and 19 graphics. It weighs about 3 pounds (roughly 6 times as much as his earlier Almanacs.) This book has a lot of great information! In the US, the United States Postal Service has a low cost shipping method called Media Mail. Unfortunately, this method does not go to Canada or other countries and the other shipping methods are relatively expensive. So far I haven't set up the shipping to other countries. If you are from a country other than Canada or Mexico, let me know and I will look into it. Orders to Canada and Mexico will be shipped via eBay's Global Shipping Proram. This saves money. For example, for one Canadian customer, if I shipped directly — not using ebay's program — the lowest cost for just the shipping (not including the book) would be $37.25 (US), but through eBay's program the shipping is $24.86 (US). It looks like eBay's program will save Canadian customers roughly $10–$13US. For international customers, when you pay (via PayPal), PayPal will also take care of any currency exchange. I will placing quotes and reviews from Doc's followers here.